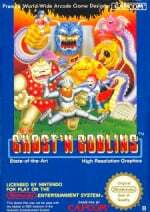 Capcom couldn't have picked a better time to release Ghosts 'n Goblins onto the 3DS Virtual Console. It's Halloween, after all, and this is one of the most classic spooky games there is. The real question is how well it holds up today, and that's one we're happy to answer: quite well, actually. Despite the fact that it was released only one year after the NES left Japan, the graphics and sound of Ghosts 'n Goblins have both aged very well. There's an effective darkness and dingy feel to the visuals that reflects the oppressive danger that you'll have to face, and the soundtrack moves from teasingly catchy to sombre and foreboding so effortlessly that you might not even notice. For such an early title, it feels impressively polished. Of course, it's not perfect, and both slowdown and flicker are common annoyances. On the audio side of things, there are enemies that swarm you and howl irritatingly, which may well make you reach for the volume control. Still, it's quite an effective package overall, flawed though it is. As for the adventure itself, you control Arthur, who is innocently lounging in a graveyard in his underpants when his girlfriend is kidnapped by demons. We've all been there, Arthur. Of course, it's his duty as a courageous knight with paper-thin armour to get her back, so he takes up his lance and not much else on his way to slay the army of the underworld. Controls are simple: A jumps, B throws your weapon, and you move with either the circle pad or the D-pad. We have no issues at all with the way Arthur controls, though compared to later, more refined games he does feel a little stiff. Your main weapon is the lance, but you can pick up others, such as the knife (which is fast), the shield (which is required) and the torch (which is useless). You retain these weapons when you die, which is great when you have something you like, but downright evil when you're stuck with something ineffective. What really gives Ghosts 'n Goblins its identity, of course, is its difficulty, and while the level design often resorts to cheapness — such as level 3's gargoyle maze or level 4's moving platforms — it's never anything that can't be overcome with a little memorisation. Each death is essentially part of the experience, and while it would literally be impossible for anyone to finish this on the first pass, the game is constantly training you to play it, to the point that you can begin to anticipate traps...just in time for something totally different to happen and kill you outright. 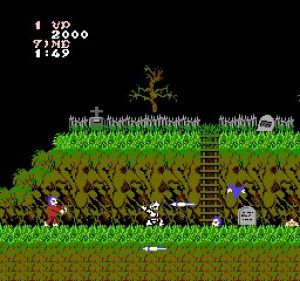 You will die often in this game, and whenever you do you become the straight man in Ghosts 'n Goblins' hilarious comedy routine. Learn to leap quickly from a falling platform and you'll find yourself jumping right into a bird. Defeat a pesky gargoyle enemy and run into a ghost that spawns right in front of you. Spend your time fighting waves of zombies off from the front and get killed by a tiny bat that snuck up from behind. It's not enough that Capcom made Satan the final boss in this game...we think it also let him design the levels. The game is so challenging it almost dares you to keep playing, and it's indeed quite addictive. Infinite continues and checkpoints that stay in effect following a game over will keep beckoning you to give it one more try, and it displays its entire world every time you die, just to remind you of how far you still need to go. It's a brilliant tease, and it'll keep even the most frustrated gamers coming back for more punishment. With only six levels it might seem like a short experience, but even with the benefit of restore points you're not likely to finish it without a lot of work, as laying down a restore point may well stick you in an unwinnable situation, requiring a death and a respawn after all. 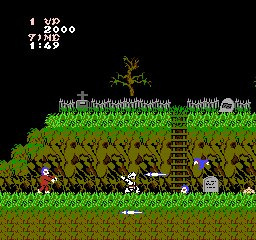 And if you do manage to finish it — cheating or not — Ghosts 'n Goblins will ask you to play through it a second time to see the real ending. Good luck resisting that temptation. In fact, it's so addictive and demanding that it really is unfortunate that it's marred by regular graphical overload and a stiff-legged Arthur, who isn't nearly as responsive as he was in the arcade and as he would be in later games. 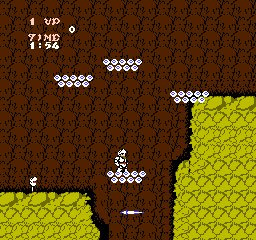 It's also more than a bit irritating that the levels earn their fiendish difficulty by way of cheap surprise rather than through fair but demanding challenge. That's the biggest complaint that detractors tend to have with Ghosts 'n Goblins, and we find it difficult not to agree. 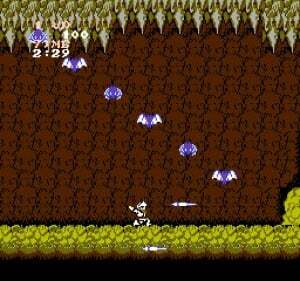 So it's true that Ghosts 'n Goblins is unfair, and it's true that it absolutely relishes your failures. After all, being forced to run around in your underwear after taking a hit is still one of gaming's greatest humiliations. But it's also true that Ghosts 'n Goblins is fun. It may be evil and it may be cruel, but success in this game is such a satisfying experience that we can't keep ourselves away, and we're happy to see it reanimated once more. 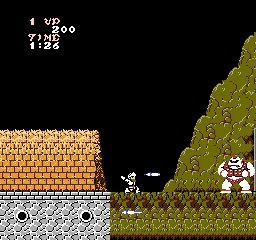 A milder climate of difficulty in modern games makes Ghosts 'n Goblins seem even more challenging than it was upon release, and it's absolutely not for the faint of heart. It's unquestionably a classic, however, and its relentless difficulty only feeds into its charm. Restore points soften the frustration of the more punishing sections, but by no means do they make this game easy. Those seeking a brutal, seasonally-appropriate challenge will be more than well served here, but anyone who is not prepared for the fight of their lives is advised to leave this behind and move along, quickly, before those red gargoyles see you. Nice review! So gonna play this tonight. maybe ill pick this one up, looks fun! I don't usually torture myself, but when I do, its with this game. I'll download this when it comes out in Europe on the eShop. Now I have an excuse to throw my 3DS and break it. Honestly, I never liked this game. It's just... bad. Like, bad. I simply can't understand how some people can call it a "timeless classic" or a game that has "aged well". Makes me yell "No! A thousand times no!" inwardly every time I hear such statements. Awesome review Phil! Nothing like some masochistic fun to celebrate Halloween in style! I almost picked this up for my NES for $4.99 several months ago, but having the Arcade port on the PS2, I didn't. After watching the AVGN's review, I just had to play it, but of course, I got it for the 3DS so I could use Restore Points. That's probably the only way I'll beat it. Ghost 'n Goblins is one of the greatest games Capcom has ever made. Thank god the Circle Pad Pro came with a wrist strap! Amazing review, but James Rolfe did a slightly better job. Your's came veeeeeeeeeeeery close, though. Can't wait to get my mitts on this one. I'm anticipating the challenge ahead! I was excited for this game until I found out how hard and cheap this game plays. My 3ds thanks you Nintendo Life. 2nd hardest NES game out there. Right behind Dragon's Lair. XD And those crappy ones don't count, like DR. Jeykll and Mr. Hyde, of course. Believe me, VVVVVV is a walk in the park compared to even level 1 of this game! When people use the phrase "NES hard" this is what they mean! Amazing review, but James Rolfe did a slightly better job. Your's came veeeeeeeeeeeery close, though. That's actually one of the nicest things anyone's ever said to me. "the soundtrack moves from teasingly catchy to sombre and foreboding so effortlessly that you might not even notice"
this is very true as it would continue in the snes and genesis games as well. and only fans of this series would understand that. the question is, which game is harder, this or holy diver? Games these days are way to easy, kids have no patience for playing the same board over and over till you get good enough to beat that level. 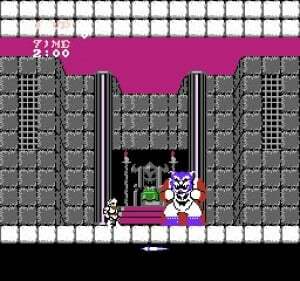 My son got angry and quit when i had him try mega man 2 can you imagine if i let him try mega man 1 or castlevania. Bunch of nancies kids are theses days, if its not givin to them on a silver platter they don t like itn or its too hard. I say bring back the old days when beating a game meant something. Looks like you got a good, yet evil, game Phil! I once had this briefly for my old famicom. I thought it was the worst looking and worst sounding game I had ever tried and returned it to the store immediately. @Aqueous Yeah that's what I thought, too. I have the Ghosts n' Goblins trilogy for Sega Saturn, and even though I played the crap out of this game as a kid, once you have access to the sequels there's no reason to EVER play this game again. Still, that didn't stop me from pumping who knows how many quarters into this game when I found it at an arcade a couple of years ago. i was so pleased when i completed this back in the day, it was a master achievement! few games were harder! @hendie001 Ha, yep....gettin' older by the second! I won't be downloading this game because I still have the original NES cartridge in its original box. I only beat the game ONCE and it took me 3 and a 1/2 hours. Good luck to those of you who are playing it for the first time. funny, i saw that review right after i read this. Really happy this is out on European VCR tomorrow! The arcade version was a great game. This NES version... really isn't. It has aged very poorly and they could have easily released the arcade game like they did on the Wii.